While Snapchat taken up the mantle of being the "cool" social media app - which it's been able to enhance by focusing on exclusivity over functionality - one of the core limitations of Snapchat's "in the know" interface is that you can't really search for anything in the app. 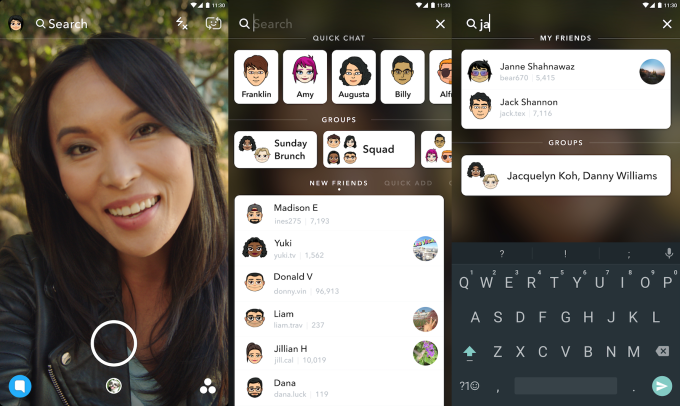 And while there are limited search options available - you can find and add connections from your phone's contacts list or by Snapcode, or connect with nearby friends, and it is possible to find official Stories when you search a specific username - the process of discovery is hard. Even when there's great content within Snapchat's network, they're likely not capitalizing on it because it's simply not visible to a significant portion of the app's audience. To help with this, and in what can be seen as another step towards mainstream acceptance ahead of an expected IPO, Snapchat has today added a new search function, which will remain present at the top of your screen while you're in the app and will help you connect with people to generate more engagement. But it's not really a huge help - or at least, it doesn't appear to be in this first iteration. 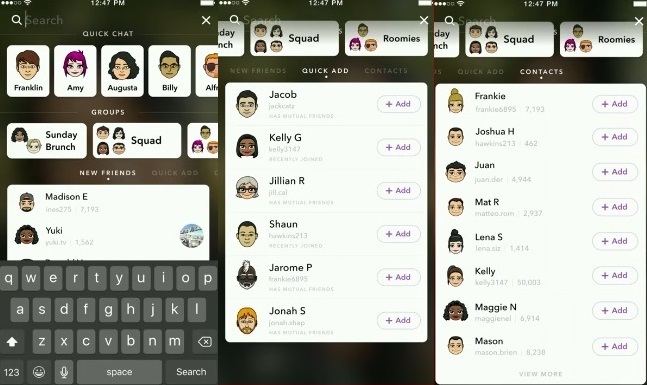 None of these are really extended search functionalities, Snapchat's not showing you new accounts to follow or popular accounts, it seems more designed to make it easier to connect with your existing contacts and establish connections with those you know but haven't connected with yet on the app. This sticks with Snapchat's ethos of maintaining that cool factor - that you need to know who to connect with before you can connect with them - but it doesn't add a lot in terms of wider discovery. But as noted, this may only be an early version. TechCrunch does say that you can find "specific daily editions of Discover channels or particular Our Stories by searching for their titles", so there may be some improved discovery potential in helping you locate relevant content, but again, it's not a huge functional leap. In addition, Snapchat's also changing the way users contribute to Our Story. Previously, if you wanted your Snap to be considered as part of an Our Story collection - a collection of Snaps around a certain event or topic - you needed to select a specific Story to contribute to. Now, you can simply indicate that you're happy to have your content considered for Our Story and Snapchat's team will judge what gets included. This widens the pool of content for Snapchat to use, which could make Our Story stories more diverse. Overall, it's an interesting addition for Snapchat, but it looks like it may just be the first stage of a wider search strategy for the app. 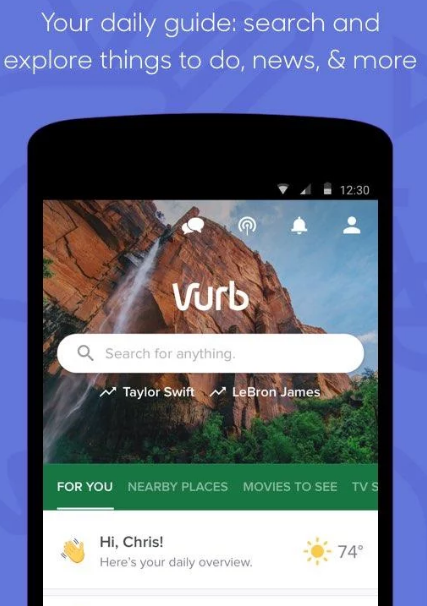 Snapchat acquired search and suggestions app Vurb back in August, a tool which focused (before being shut down after the acquisition) on helping users uncover relevant businesses and places to go based on community recommendations. One of the ways this functionality could most easily be integrated into Snapchat is in chats - through Vurb's chat feature, users could recommend places to go, complete with directions and reviews, all within the chat window. Given the functionality of Vurb, it seems obvious Snapchat is looking to do more with search than what appears to be on offer here. Maybe, once users are accustomed to search, Snapchat will look to boost its functionality and integrate more features - which could eventually see it becoming a much more relevant consideration for businesses. The new Snapchat search is being released to selected Android users initially, with a wider roll-out, including iOS, in future. UPDATE (1/23): The new Snapchat Search functionality has now been rolled out to iOS users also.